Sorrento Surf Club is a family based club that values the junior members as the future of the club. The junior programme is based upon the development of youth within the club as future active patrolling members and training for those wanting to participate in competition. The strength in maintaining the junior programme is through the active participation of parents who contribute in activities ranging from water safety through to competition officials. 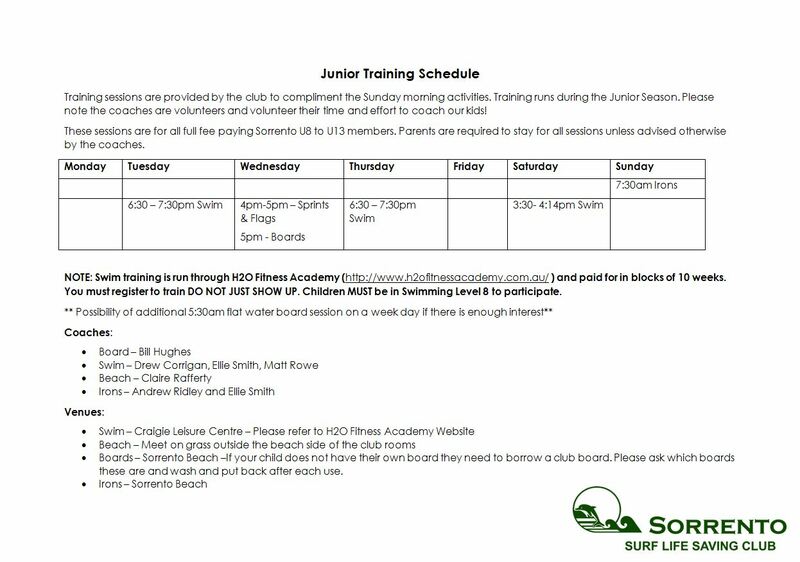 The surf club has two categories for Juniors (or 'Nippers' as they are commonly referred to). These being 'Juniors' aged between 5-13 years and a Youth programme (Cadets) for those aged between 14 - 17 years. Juniors and Youth are divided into age groups for both competitions and receiving SLSA accreditation. Sorrento SLSC has an arrangement for a photographer to be present at many of the Junior and other club activities. Some photographs are used to promote club activities and are posted on the club website and social media accounts maintained by the club and for some age groups. Many parents love to share photos of their nippers with family. The photographs are also available for purchase from the photographer’s website www.andrews.photo and any enquiries about this can be directed to the photographer. Warm clothing to change into afterwards (dependant on weather). Sorrento SLSC fully endorses the Sun Smart recommendations and guidelines for Juniors. Therefore any Junior members with inadequate sun protection will not be permitted to participate in any club activities. The nature of surf club activities means that personal belongings and valuables are left unattended for extended periods of time on the beach. For safety reasons Sorrento SLSC requests that members do not bring any valuables/jewellery (with the exception of Medic Alert bracelets) to club activities. This will also reduce the risk of theft and loss at the Club. Please be aware that Age Managers and Club Officials will not take any responsibility for lost valuables nor will they will be able to hold or looks after any valuables during Club activities. Bathers, pink rash vests, tshirts, hats, rashies and caps are available for purchase from the club clothing shop. The Clothing Shop is open during the season on Sundays from 8am-9am and Wednesday nights between 6.30 pm and 7.30 pm (please note this many change during the off-season). Please support and promote the Club by purchasing your requirements at the Uniform Shop. Please note these times may change, the weekly newsletter will give you updates. If you want to help in the uniform shop, do not hesitate to ask we are always looking for volunteers. Sorrento Surf Club is a volunteer organisation and very reliant on the efforts and support from parents and club officials. Parents are required to participate in junior activities during the season and activities can range from water safety, competition officials through to social or helping out with the weekend BBQ. The safety of juniors is the highest priority for the club. While Sorrento is typically a relatively safe beach, the surf conditions and weather can change suddenly. One of the skills learnt in surf lifesaving is to become familiar and confident in hazardous surf conditions. This may require juniors to deal with confronting a fear in rather provoking and challenging conditions. This will require appropriate number of parents to be involved with water safety. Age managers will need to insist on the appropriate level of parents in the water in order for activities to proceed. While parents can assist in club activities and water safety without and formal SLSA qualifications we encourage parents to consider achieving some formal training. The Surf Rescue Certificate is a recognised course which covers fundamental surf lifesaving and resuscitation. Parents can also progress further qualifications including Bronze Medallion, IRB Driver, First Aid and Advanced Resuscitation. Qualifications of Bronze Medallion and above will allow members full use of club facilities including use of gym equipment, ski and boards and entitled to compete at masters competitions, however will be required to participate in patrols. Parents wanting to pursue training should register with their age managers or training officer. Parents are also able to participate in our structured swim training programs for fitness. Look at our training pages for more information on how to get involved. To participate in SLSA Carnivals, each club is required to provide one competition official for every ten juniors competing. Club officials are critical to running of SLSA carnivals. Training courses are run by SLSWA with the club funding training for parents wanting to be involved with being an official.